They think "playing an Oasis classic" meant he was playing a song in the street... sure, money-driven Noel playing for free, can you imagine? (asking money even in charities) ...nah, it meant he was making this gesture, the V sign. Of course Holymoly is now speaking well about him... just because of this gesture... When it's Liam doing it (who is not a media darling), all the people are ready to insult, judging him just from the worst photo the tabloids choose. more about nazicommunist illminati, now in F1 in this video, also featuring Noel. 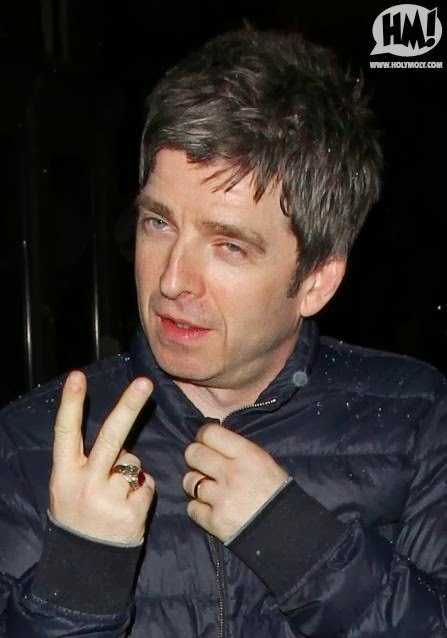 Liam always mocked Noel's illuminati stuff, even calling his band "Beady Eye" (and the first song Bring the light, like Lucifer the light binger, and Beady Eye singles with "only one eye"; etc. ), the illuminati eye controlling everything.